Join us on Sunday mornings for worship at 8:45am|10am|11:15am. Main Street – Hillsville – Pastor Ronnie is “Wrapping it Up” this week and finishing the “All In” series. You don’t want to miss it, come join us, everyone is welcome! Recovery at Out of the Box – This is a new ministry that is in the development process. If you are interested in serving on the Launch Team for this ministry or have any questions, please contact Pastor Ronnie at ronnie24317@yahoo.com. Prayer Group – Misty Collins is forming a prayer group and there will be an interest meeting this Sunday after the 11:15am service. If you are a Prayer Warrior and would like to get together with others each week and pray, then contact Misty Collins at misty24317@yahoo.com. Relay for Life needs volunteers to help with fund raising for the American Cancer Society. Please contact Cindy Brown at browniebitesofwoodlawn@gmail.com or 276-733-6228 to get involved and be a part of the Relay for Life Team. OOTB Relay for life team will have their Kick off meeting 3/20 at 6pm at the Youth Center. Finger food, Fellowship and information for the year will be provided. ANYONE wishing to join the team please come to this meeting. 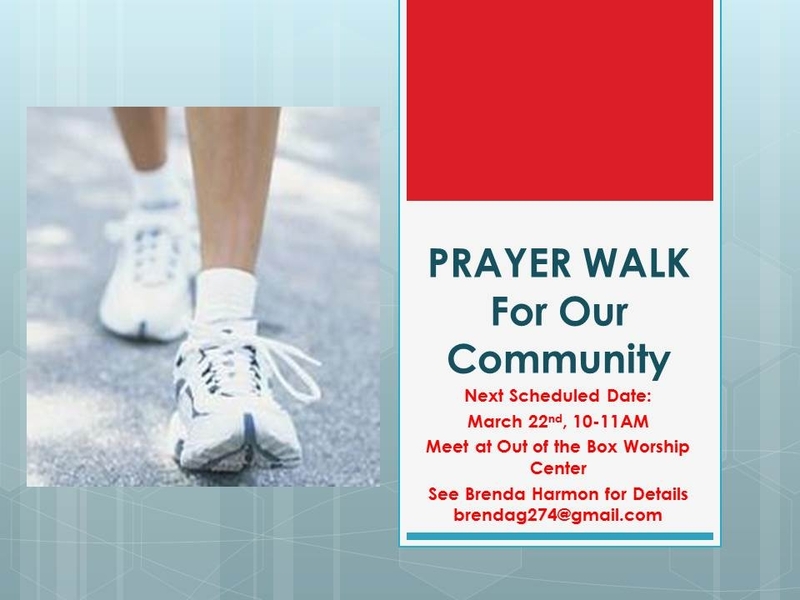 Prayer Walk – join Brenda Harmon and others from our church and community as they walk through Hillsville and pray for our church, for our nation, for the lost, and many other prayer concerns. The group will be walking on Saturday, 3/22 from 10am to 11am and then on the third Saturdays of April (19th), May 917th) and June (21st). Volunteers are needed in all ministry areas at Out of the Box Worship Center. Check the Opportunities to Serve page on the website. Right now we especially need volunteers in Children’s Ministry and people to serve one Sunday a month on the Information Desk in the Lobby during the 2nd service and 3rd services. Women’s Bible Study -Wednesdays at 10:30am at the home of Tammy Payne in Galax. The study will be One Thousand Gifts by Ann Voskamp. Women are invited to come, children are also welcome and bring you own packed lunch to have after the study. Wonderful Wednesdays at FUMC Hillsville on Fulcher St. The Children’s Music Curriculum is “Radical Retro Ride. Supper is at 5:30 PM. Children’s and youth activities are from 6 to 7 PM. Women’s Bible Study – Wednesdays at 6pm starting 3/19 at the home of Donna Cato in Galax. Snacks and fellowship at 6pm then Bible Study at 7pm. Contact Donna Cato at dcato139@gmail.com for more information. Youth: Meet at OOTBYC on Main Street – Center opens at 5:30pm and bible study starts at 6pm. The Daniel Plan – Join this group of believers as they support each other in following The Daniel Plan together. The Daniel Plan is a faith based healthy lifestyle program that focuses on faith, food, fitness, focus and friends. Contact Jason and Nicole Burcham at jayncole@yahoo.com for more information. Crafters for Christ – is a group that meets regularly at OOTBWC and makes special gifts, cards and service projects for others. If you like doing crafts, knitting, crocheting or sewing and want to get together with this group, contact Cindy Brown at browniebitesofwoodlawn@gmail.com or Bonny Webb at bdwebb@ccpsd.k12.va.us. The next meeting is 3/29 from 10am – Noon at the Youth Center. SOHO Missions/Outreach Team Meeting will be held the first Tuesday of each month beginning 4/1 at 6:15pm at OOTBWC. Questions? Contact Brenda Harmon at brendag274@gmail.com. Suicide Prevention Concert – “Live for Life, Don’t Hasten Death” Music Festival – Friday, 4/4 from 2pm – 11pm at the Hillsville VFW. This is a benefit show for child abuse awareness and suicide prevention. Safe Sanctuary Training Day – Saturday, 4/26 at Out of the Box Youth Center for everyone serving in the Children’s Ministries at Out of the Box Worship Center. Watch the announcements for more information and contact David Payne at daveandtammy@centurylink.net. Camp Dickenson – is a summer camp for kids and is part of the Holston Conference of UMC. Camp Dickenson is staffed by many OOTBWC young adults, so your kids will see a familiar face during their summer adventures. View more info and register here. Nicaragua Mission Trip – There is a mission trip to Nicaragua planned for August, 2014. If you are interested in going on this mission trip, contact Laura Edmonds at laura.h.edmonds@gmail.com. This group of missionaries needs our love, prayers and financial support. You can give to this Mission Trip by earmarking your check to “Nica Mission Trip”. Inclement Weather Policy – If Carroll County Schools are closed or dismissed early due to the weather, all activities and meetings at OOTBWC and the Youth Center will also be canceled.